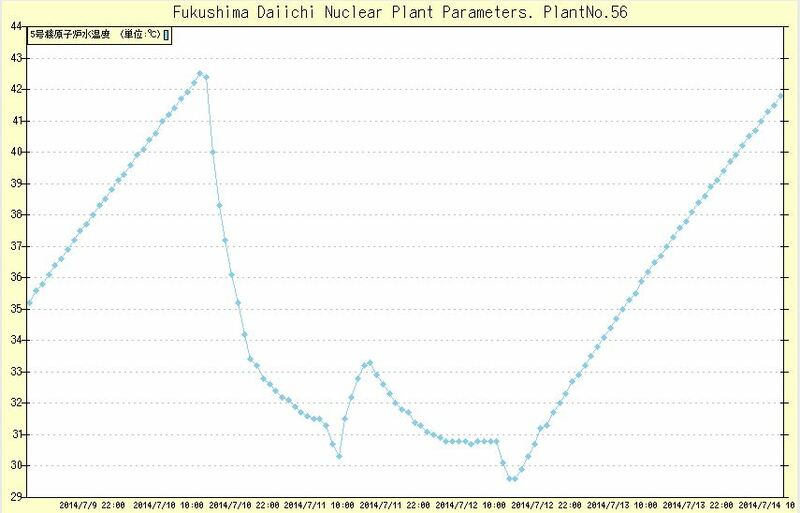 A detailed TEPCO document from July 2018 gives some important new insight into the meltdowns at Fukushima Daiichi and the future inspections. This new information also revises a number of old inspections. The report includes information on future inspection efforts and also important new results on samples taken within the reactor buildings and containment. This new information will help guide the small scale and large scale reactor debris removal efforts. This also reveals new insights into the environmental consequences of the disaster. These will take place in containment with a swimming robot. The robot will enter through the X-2 containment penetration. This work will take place in the latter half of the 2019 fiscal year. Ultrasound will be used to collect data on the sediment on the containment floor. This will record the sediment general shape and depth. This new robot will include an on board neutron detector to determine neutron radiation from the containment sediment. More sediment collection will also be conducted by this robot on the upcoming inspection. Diagram of the unit 1 swimming robot and the mechanism to manage the robot. Another containment inspection at unit 2 will take place in the second half of 2018. TEPCO didn’t clarify if they meant the fiscal year but this is normally what they use so we assume they mean fiscal year 2018 that runs into March of 2019. This inspection will use the same X-6 containment guide pipe used on previous inspections. There will be an additional inspection at this location using an articulated expanding arm device with a total reach of 22 meters. This will allow greater maneuvering to obtain sediment and fuel debris samples. The second inspection will take place the latter half of fiscal year 2019. Since the properties of the fuel debris inside unit 2’s pedestal is still not fully understood they will add a new collection device to the probe. This should enable collection of fuel debris for analysis. The articulating arm that will be used in the second of the new inspections appears to be much like the prototypes in development for actual fuel removal work. This inspection work should give some useful data on the functionality of this type of equipment. There are vague plans for more containment inspection work at unit 3. This will require reducing the water level inside containment so lower access ports can be used. Swimming robots will be used as were used on a previous containment inspection. Samples collected during the 2019 inspections will be sent to a government run nuclear hot lab in Ibaraki for analysis. Since samples may contain uranium or plutonium they need to be inspected in a facility capable of handling nuclear fuel debris. TEPCO expects to increase the amount of fuel debris samples for testing into fiscal 2020. A hot lab is under construction on site at Daiichi. It is expected to be operational around 2020. Transport of fuel samples or highly radioactive debris will be done in shielded containers. These would be needed to move a sample to the lab in Ibaraki. They would also been needed to move a sample from the reactor buildings to the future on site lab. The B type canister in the diagram below is the highest level container being considered. The first sample is expected in mid year fiscal 2019. This would be sampling from unit 1’s containment taken by the proposed floating/swimming robot. Unit 2 sample collection done with the planned articulating arm would be done in the latter portion of fiscal year 2019. Fuel debris in unit 2 assumed to have much higher levels of radiation would be collected in the latter half of fiscal year 2020 according to this plan. A number of tests would be conducted on the samples. These include the types of analysis done on the fuel microparticles found in the environment and also tests to determine the hardness of some of the samples. This would give researchers needed information to develop cutting tools for large scale fuel debris removal. These higher radioactivity samples will also require measures to prevent criticalities as they handle the materials. Small debris that is described as being above a “sandstone” debris layer was collected from the floor of unit 1’s containment in 2017. This is different than a sand like debris previously reported by TEPCO during this inspection work. Initial analysis confirmed it contained uranium, CS-134, CS-137, Co-60, and Sb-125 and structural materials. Isotope analysis of the samples found plutonium 239 and americium 241. The full isotope analysis can be found in the supporting documents. The uranium is bound into a crystal with the zirconium from the fuel cladding. These samples were collected in 2017 by collecting sediment on the guide pipe used for containment inspections. Again TEPCO describes uranium on iron rust in the sample. Zirconium from fuel cladding was found in proximity of the uranium as were Fe (iron), Cr (chromium), and Ni (nickel). This swipe sample was taken on the unit 2 refueling floor in 2018. The swipe would have picked up loose fine debris. The sample was found to include Sio 2 (silicon dioxide). This is a major constituent of sand and concrete. Constituents of sea water were found in the sample, Na (salt), Mg (magnesium) assumed to be from sea water, Fe (iron), and Al (aluminum) were found in the sample. The silicon dixoide formed tiny glass balls, similar to radioactive microparticles found in the environment. These were found adjacent to the uranium particle that also formed a spherical shape. The images below are from the refueling floor swipe. Isotope analysis of the samples also found plutonium 239 and americium 241. Full isotope analysis can be found in the supporting document. Samples ranged from 45 to 200 mSv/hour for y-rays and beta radiation only. Gamma radiation readings were not provided. The samples included structural materials, Co-60 (cobalt 60), Mo (molybdenum), and CL (chlorine). No uranium was found in these samples. 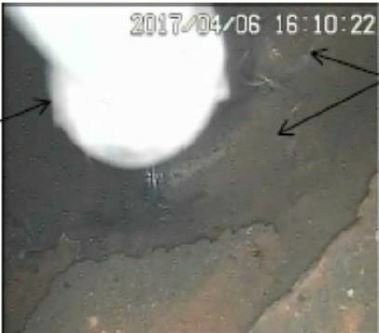 This swipe sample taken in 2017 after the robot inspected the reactor pedestal showed uranium in the sample. The uranium was found again to be mixed with iron. The tiny cluster shows the mixed material. TEPCO didn’t specifically report other isotopes in this sample. These found uranium containing materials in the various samples show crystalized or spherical particles of uranium. Uranium was frequently found with iron substances, zirconium cladding or glass spheres. These substances are similar to the black sand and glass sphere radioactive microparticles found in the environment. The unit 2 refueling floor swipe indicates that the radioactive glass spheres in the environment may have originated from this unit. The conglomerated crystalline nature of the unit 1 and unit 3 uranium particles may be the origin sources of the black sand type microparticles found in the environment. Further investigation is needed to refine and confirm this assumption. All of the samples found nuclear fuel residues except the TIPS probe sample. The TIPS sample appears to be mostly metals from the reactor structures that happen to also be radioactive. The unit 2 refueling floor swipes further confirm that fuel microparticles left unit 2 via the reactor well and the blow out panel. Unit 2 had been the largest ongoing source of radiation releases to the air at the site. TEPCO is now in the process of preparing to remove the roof from this portion of unit 2 after conducting clean up operations inside. These new findings further confirm assumptions about nuclear fuel being ejected to the environment, the degraded nature of the fuel debris and what may have taken place during the initial disaster. The planned inspections should help further understand these events and provide data needed for developing fuel removal plans.